Goldman Sachs predicted that spending on cloud computing infrastructure and platforms would grow at 30 percent compound annual growth rate from 2013 to 2018. The adoption of cloud computing is accelerating faster than what was expected at the initial stage. Businesses are moving to cloud as the technology not just makes data access easier, it also has several other benefits that directly impact the overall growth in terms of profit and productivity. We list the five main reasons why cloud computing is the right choice for small, mid-size and big scale enterprises. Savings in terms of IT cost is one of the most significant advantages of cloud computing. Businesses can save a substantial capital cost with no in-house server storage and application needs. When there is no need of on-premises infrastructure, it also removes additional expenses in the form of admin staff, power, air conditioning, etc. Businesses pay only for what they need and are free to discontinue the service, if not satisfied. Cloud computing has a managed service platform that is more reliable and consistent than in-house infrastructure. Most of the cloud computing service providers offer Service Level Agreement that guarantees to provide assistance 24/7 for 365 days. The business, in this way, is saved from hiring IT resources or facing a situation of server failure. The service provider can easily move hosted applications to other servers. Vendor managed infrastructure, SLA, and improved maintenance capability through a centrally administered process make cloud computing management easy for businesses. There is no need to upgrade the IT infrastructure, as it is the responsibility of the service provider to take care of the updates. The only thing that a business needs to do is access a simple web-based user interface for all the applications, software, and services without worrying about the installation part. When a business deploys a mission critical application on its internal server, it could bring a significant burden on the budget. Cloud computing gives the freedom to deploy such applications without any upfront cost. Businesses by moving to cloud get more time to spend on their core growth objectives. Data and application access gets hassle-free for employees, irrespective of their location. Cloud computing provides employees an ease to take their device i.e. tablet, smartphone or laptop anywhere and stay connected with the team. Even if employees don’t have a mobile device, they can still access the data from a desktop. Improved mobility makes it easy for a business to share essential data and track its employees in real time. 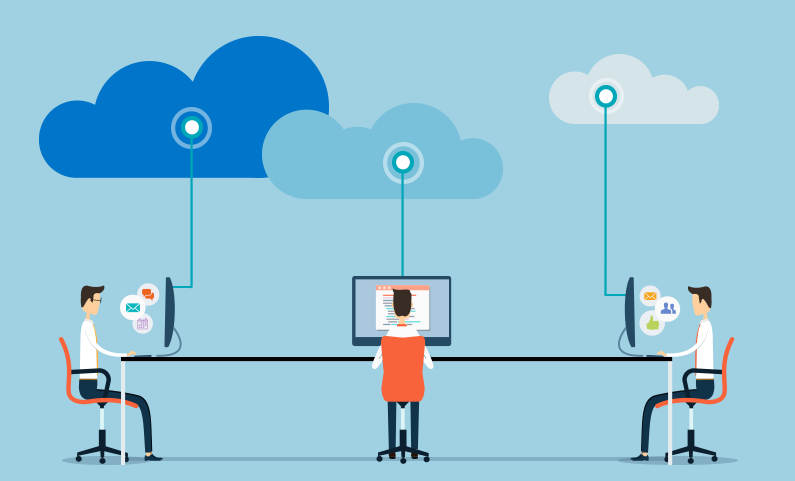 Cloud computing is bringing a positive change in the way businesses operate. The technology allows users to set up a virtual office anywhere, anytime. Although it is still in the evaluation phase, we don’t see any pause or decrease in the rate at which businesses will adopt cloud computing in the coming time. If you have still not moved to the cloud, it is high time to upgrade yourself to an easy, safe and advanced solution to store, manage and process data. Get in touch with our experts to learn more about cloud computing and how i2k2 Networks can help you get started. Call us at +91-120-466 3031 for any assistance.